His book arrived in the mail yesterday. I must confess that it is one of forty books that I have ordered in recent weeks. New home, new bookshelves, I am creating a library to support my future work on the raceless gospel. I want to be surrounded by these conversation partners. I have also decided that I want to be buried under my books. Please tell my family to pile them on top of me and now that I think about it, under me as well. I will rest on pages. But before then, I will read his book and so many more. Tisby’s book is where the conversation on race and the church in North America should start: with the realization and acceptance of our role in its existence. Race is not just a social construct, but an ecclesial one. Beginning with the bombing at the Sixteenth Street Baptist Church in Birmingham, Alabama on September 15, 1963, Tisby calls us to account for our complicity. He writes, “Historically speaking, when faced with the choice between racism and equality, the American church has tended to practice a complicit Christianity rather than a courageous Christianity. They chose comfort over constructive conflict and in so doing, created and maintained a status quo of injustice” (17). For him, we must start by owning what we have allowed by letting racial identities persist and racialized injustice to continue in our families, churches and neighborhoods. Providing a historical survey, this is more than a history lesson but a call to action. He recounts our sinful past so that we can face this present moment with the assurance that it need not be repeated. We can say and do something different. Tisby is convinced of the possibility. He says, “Christians deliberately chose complicity with racism in the past, but the choice to confront racism remains a possibility today” (19). From American slavery to the Black Lives Matter movement, the book concludes with a how- to list, which I will not detail here. You will need to pick up the book. Detailing the history of race in the making of the church in North America increases the sense of urgency for the healing work required and before we put the book down, Tisby has given us several assignments. But, these are not ones you and I can simply check off. The change that race has made on American Christianity will require more of our time and tongue. Tisby’s words can change how we talk about race and in turn, our Christian faith. Now aware and accountable, we are empowered to say something different and in so doing, to truly see each other without race and for the first time. Last year, I had the privileged of serving with Dr. Hart at a community- wide event, aimed at race, community and the practice of our Christian faith in Henderson, KY. It was my first time meeting him and he was gracious. I had just read his book and been sharing his insights on social media. To say the least, I was excited to meet him in person and to hear more of his thoughts on subjects dear to both of us. He happily obliged, answering all my questions and offering support for future study endeavors. This time, he is closer to home. On July 22, he will be speaking at the Festival Center in Washington, D.C. at 1 p.m. and from his new book Trouble I’ve Seen: Changing the Way the Church Views Racism. It is a conversation that the church needs to have and if we are not prepared to speak, we can at least listen in. This is the title of a chapter of Rev. James Ellis III’s newest book Tell the Truth, Shame the Devil: Stories about the Challenges of Young Pastors, where he served as the editor. It is a book that includes a number of true stories from clergy who may differ in denominational affiliation but all wear the same collar and experience many of the same challenges. The above- mentioned work was written by Dr. David F. Evans, an Assistant Professor of History and Mission at Eastern Mennonite Seminary in Harrisonburg, Virginia. The truth that he shares with readers is about race’s place in the church in America. I pray that his words help us to look more closely at the ways in which we practice our faith and to examine the traditions that we share and pass down to each generation. Have a race-less day! This morning, I learned of a seventh African American- led church set ablaze. The cause for the burning of Mount Zion AME church in Greeleyville, South Carolina is still under investigation. But, before the smoke signal of this latest burning reached the news, six others in Florida, Tennessee, North and South Carolina were struck with matches. Three of them have been attributed to arson though it is still unknown as to whether the motive was racial hatred or in response to the recent murder of nine members of Mother Emanuel AME Church in Charleston, South Carolina by self- professed white supremacist Dylann Roof. Needless to say, there are many who are disgusted, outraged and shocked by this new but old and familiar story of the destruction of sacred spaces where African Americans gather to worship. And this is not the first time that it has happened to one of the churches. Mount Zion AME Church was burned down by the Ku Klux Klan twenty years ago. Added to continued cases of police brutality involving African Americans, the fight over the Confederate flag and the recent comments of presidential candidate Donald Trump who spoke derogatorily about persons of Hispanic descent, it is clear that we are not as progressive as we might hope and that we cannot even begin the work of reconciliation. We also must challenge would- be friends of cross- cultural relationships to speak up and speak out when persons make racist comments or comparisons, remarks or jokes. And we need not make excuses for those who make their prejudices and stereotypes known. We cannot give them an easy way out but must hold people accountable for their false conclusions and judgments of others. 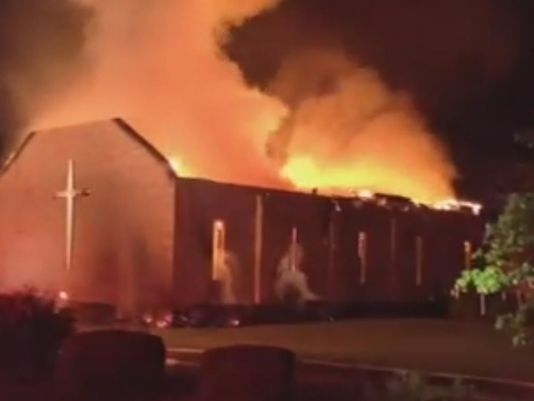 African American- led churches are burning again and again and again. We are repeating the sins of our fathers and mothers. Lord, forgive us. God, help us. Amen.